This account is based on a PowerPoint presentation given by me in October 2006 to celebrate the 60th anniversary of the Society. It was only later realised that we were one year too late! The actual 60th was during 2005. Firstly, we must consider the name Cossham. I have a replica of the original Ordnance Survey map of 1830, based on surveys carried out over the previous two decades or so. Kingswood is marked, as is Staple Hill, The Fishponds, etc., but I can see no clear reference to Cossham. Click on image for a high resolution version of the map. So, where did the name come from? It must be the same source as the hospital’s name - Handel Cossham, but why was his name seemingly transferred to the whole area? 'Bristol: The Growing City'. Redcliffe Press. Bristol, gives clue. "But not all the colliery bosses were ruthless exploiters. Handel Cossham, for instance, became the owner of two large collieries in the 19th century and he was one of the most humane employers. Cossham was a self-taught geologist and was well-known for his religious and educational work in the area. He helped to found a school for the children of the colliers in Staple Hill, and at one time his pits provided work for 1,500 men. In 1890 Handel Cossham died. Parkfield colliery and his other pits were sold off to build a hospital which was named after him. The new owners, The East Bristol Colliery Company, eventually closed the last pit in 1936, when just 180 men were still employed. One pit in Hanham opened and closed this century. 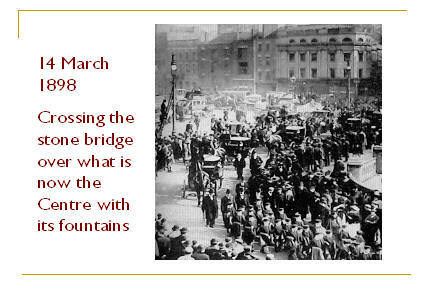 It was off Memorial Road and opened in 1906 and closed in 1926. Horses were used to haul coal and were brought up to graze in the fields nearby. The arrival and disappearance of the mines had certainly left its mark. East Bristol was now filled with street after street of small houses. Many were built to house Cossham's employees; some for railwaymen, and others, in the Easton area, for the men that worked the Easton Pit near St Gabriel's Church from 1881 to 1911." Thus my guess is that, because of all his houses, the area colloquially became ‘Cossham’s Town’. This evolved into our modern-day Cossham. However, further research, including the local ‘Oracle’, Barbara Tuttiet of the Kingswood Local History Society, reveals that there never has been an area of Bristol called ‘Cossham’. The name applies only to the Hospital and a Hall in Thornbury. Thus I, and I suspect others, have been under a misapprehension for many years! Such is life. "Handel Cossham (31 March 1824–1890) was a British MP, colliery owner, lay preacher and Mayor of Bath. He was born in High Street, Thornbury, in a house where his father, grandfather and great-grandfather were also born. His father Jesse Cossham, a carpenter and builder, named his son after the composer of 'Messiah', George Frideric Handel. was involved with many activities during his lifetime. A plaque at his birthplace describes him Cossham as a "non-conformist Preacher, Industrialist, Geologist, Politician, Educationalist and Public Benefactor". Cossham began his involvement in the coal industry in 1845 at Yate colliery. In 1848 he married Elizabeth Wethered and through a partnership with her family, began Parkfield colliery at Pucklechurch in 1851. As a caring employer, Cossham also built houses and a school for his colliery workers at Parkfield. The partnership began several other coal pits, initially under the name of Cossham and Wethered Ltd and from 1867, the Kingswood Coal and Iron Company Ltd. The business came under control of Handel Cossham and Charles S. Wills after 1879 when the Kingswood and Parkfield Colliery Company Ltd was formed. Cossham represented St. Paul's ward on Bristol City Council as a Liberal during the 1860s, and was mayor of Bath 1882-1885. He stood for Parliament in Nottingham (1866), Dewsbury (1868) and Chippenham (1874), and was elected MP for Bristol East in 1885 and 1886. In 1862, Handel Cossham built the British School in Thornbury, which remains today. Also, the Cossham Hall, which was built as a Wesleyan chapel, was purchased and donated to the town by Cossham in 1888. In 1890, whilst in the library of the Houses of Parliament, Cossham was taken ill and died the following day. An estimated 30,000 people lined the streets on the day of his funeral, and many attended the ceremony. His estate amounted to £59,127 and, in 1900, his collieries were sold at auction for £61,000. The Cossham Hospital in Kingswood, Bristol is a memorial to Handel Cossham, who instructed in his will that his estate be used for the building of a hospital." 30 thousand! That’s a large number of people – more than City or Rovers get at their league games. I couldn’t find a picture of the funeral but, to give you a flavour of what it must have been like, I did find one of George Müller’s funeral – he of Muller Road and Muller Orphanages. Note that we have long dropped the umlaut in his name! 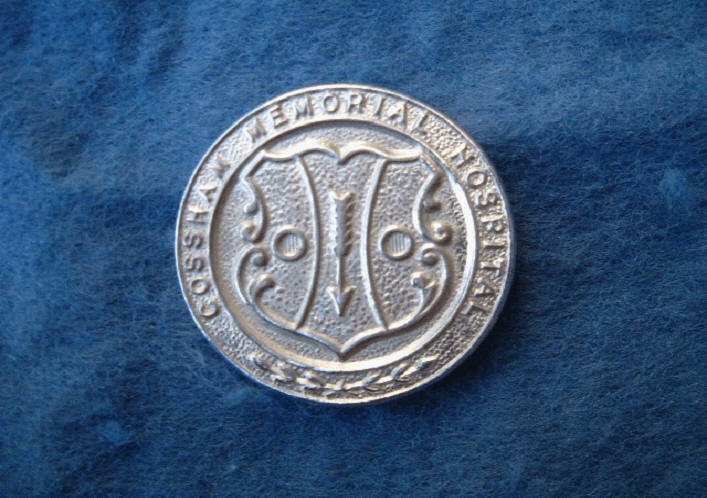 "Conspicuous from afar, on the height of Kingswood Hill, stands the Cossham Memorial Hospital. Mr Handel Cossham rose from the position of a clerk in Yate Colliery to be one of the largest colliery owners in this district. He became recognised as an authority on local geology; was popular as a speaker at great political gatherings, and eventually was returned to represent Bristol East in Parliament. On April 23rd, 1890, his death occurred suddenly, and later it became known that he had left funds for the foundation of a hospital in the Kingswood district, with which, as an employer, he had been long associated. The problem which presented itself to his trustees was not a simple one, but they managed so well that many years after, when they were able to give practical shape to the scheme, the public were surprised at the amount available. By accumulating the proceeds from the colliery and then selling the property, £120,000 was realised. and, with the sanction of the Court of Chancery, £30,000 was apportioned for building and furnishing the hospital, the balance being invested to form an endowment considered sufficient for the maintenance of 50 beds. The Cossham Hospital, opened on June 1st, 1907, by the Right Hon. Augustine Birrell, M.P. for Bristol North, commenced its career, therefore, under exceptionally favourable conditions. Designed and equipped with the knowledge of the requirements of modern medicine and surgery, its maintenance has been secured by its endowment. Although spoken of as in Kingswood, and situated on Kingswood Hill, this Hospital is really on the edge of Stapleton parish, and is therefore within the municipality of Bristol." 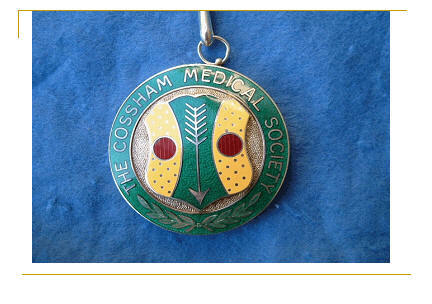 Cossham Medical Society. The Formation. 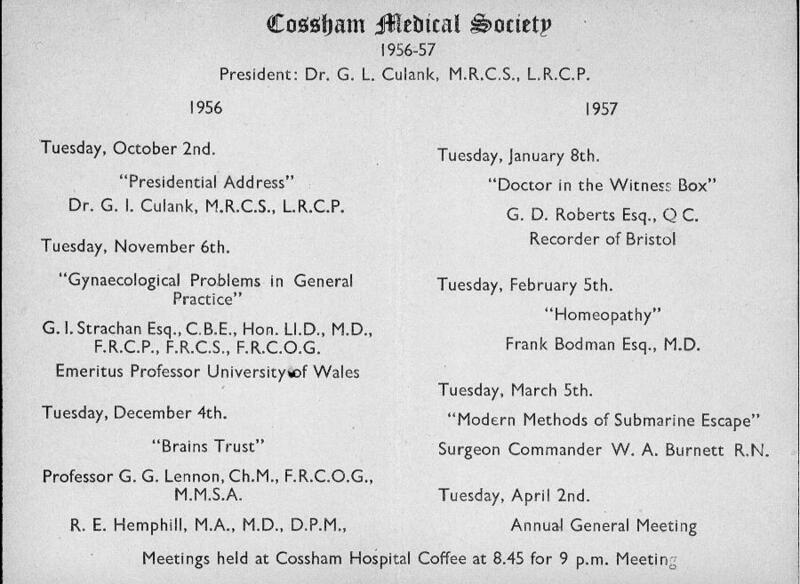 In 1946 the general practitioners practising in the district around Cossham Hospital decided to form a learned Medical Society. Many of them had just returned from the war, the remainder had minded their absent neighbours practice's during the conflict. At that time there was no post-graduate teaching other than a formal professorial Sunday morning round in the B.R.I. The concept of a learned Society was both novel and way ahead of the times. 48 G.P. 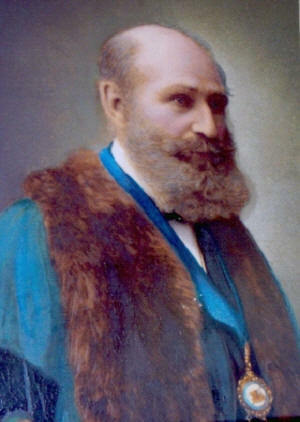 's attended the inaugural meeting when Dr. P. T. McDonald from Kingswood was elected the first President. It was agreed that, on the first Tuesday of every winter month a distinguished expert should be invited to address the members on his subject, hopefully to the benefit of the listeners; it was also decided that membership subscriptions should be half a guinea, and that there should be a cocktail party on the last Saturday in November, (of which more anon). The inaugural lecture was given by Professor Bruce Perry entitled 'The Application of Penicillin Therapy'. The meetings were originally held in the library of Cossham Hospital; if an above average attendance was anticipated, the mortuary room in the basement of the hospital was cleared. The first meeting that I attended was held in this room, and Harry Sheppard filled and entertained all in the morgue with anecdotes concerning his honorary post as Bristol Zoo obstetrician (a vaginal examination of a labouring giraffe was complicated by his finger being bitten by the foetus). 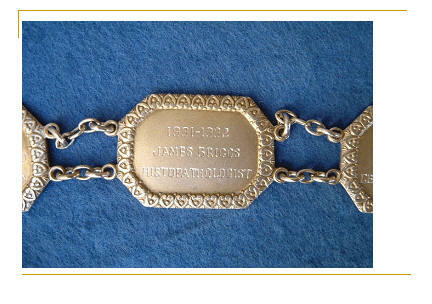 By 1960 membership had grown to 74 and the first consultant was proposed as a member. Is it significant that he was Dr. R. E. Hemphill, the distinguished psychiatrist? It is not clear what the founding members had in mind for a cocktail party. It is apparent from early financial reports that the profits in the early years were so great that the surplus could subsidise a social event. However, the tradition was quickly established of gathering in the President's home (the tenure of the President is one year); tongues were loosened by Barty Orten's champagne cocktails (or to be precise 'whore's blushes'), eating the supper brought by the wives of the committee, drinking the wine selected by the President, and finally rolling back the carpets for dancing until the small hours. There have never been any tickets or advance knowledge how many would come, invariably 70-75 turn up (never the same 75). With the opening of the Frenchay Post-Graduate Centre and the explosion of post-graduate education in the early 70's, the Society, somewhat reluctantly, moved to the Post-Graduate Centre, where we have been made most welcome. The first consultant President was Herbert Bourns in 1974. The second, Colin Davidson in 1977 had the foresight to broaden the base of the meetings and have some open evenings for spouses and non-medical visitors. Latterly Chris Burns-Cox decreed that every meeting shall be open. Recent titles vary from "18th Century Glass" to "Perinatology in the Bible". The lectures are invariably entertaining and well attended. The 25th Anniversary was celebrated with the planting of a flowering cherry outside the Post-Graduate Centre by the oldest surviving President Dr. S. F. Marwood. We have not yet decided on the appropriate celebration in 1986. Dr. lan McDonald, the son of the President and the only surviving founder member, is giving the matter some thought. We trust that he will have many ideas for the 40th celebration of this unique Medical Society which is of such good value, the subscriptions having risen from half a guinea to £2 in 38 years. Alas, the cocktail party can no longer be subsidised!! The original members in 1946. Note the name of JL Paull. Wasn’t he a consultant at Cossham – the first one then? On the morning of this lecture I had a phone call from David Kitchen, former local GP and past President of the Society. The surgeon was Gordon Paul. Thus, again I was wrong. The Society’s 40th Anniversary and the Menu. The menu on the 60th was not quite as good! The Society’s Chain of Office. 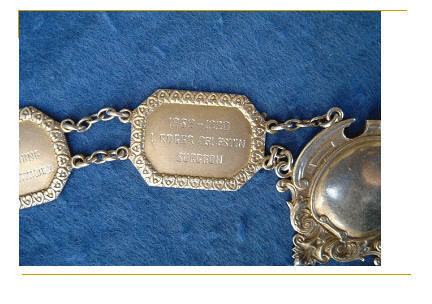 Background to the Jewel and the Chain of Office. By Roger Celestin. President 1989-90. 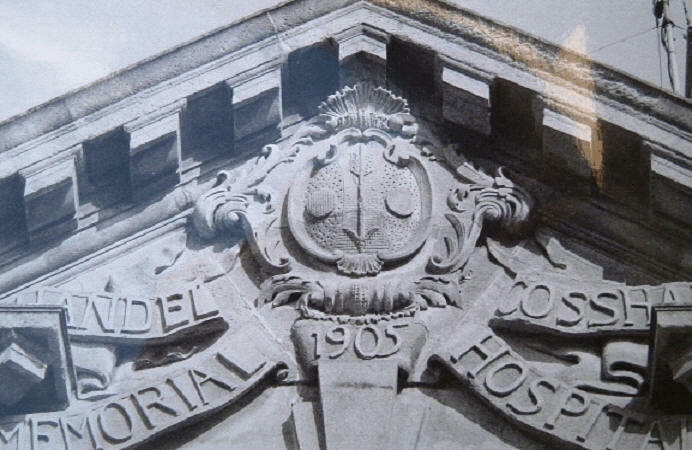 As the Society carries the name of its founding Hospital, it was felt that a chain of office should speak to the memory of the Hospital's benefactor. The tower was its most significant feature. It housed under its copper dome the high level water tank needed by the Hospital. A smaller higher cupola carries a gilt vane with a shield apparently drawn by Handel Cossham for himself. That shield became the blue print for the jewel of the chain. I could find nowhere any evidence of the involvement of Cossham in this shield, nor an original drawing of it, nor an explanation for the broad arrow on it or of the circles on either side. It is possible that the arrow bore an association with hunting. 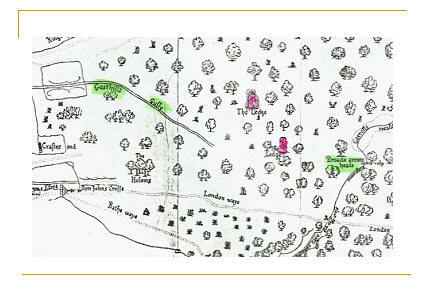 A study of a map of 1610 and of the history of the area proved useful and helped with the details and the colours that now make up the jewel. The name of the area derives from the forest to the East and North-East of Bristol where the kings of England would come regularly to hunt. The Frome formed part of its northern boundary with its many mills, and much of the area between the Frome and the Avon was marshland drained by the Gasthill’s gully. Arrow Head. With the above findings and knowledge, the jewel was evolved. 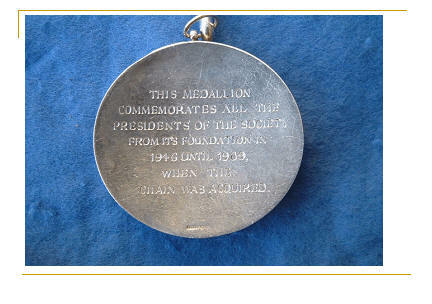 From the 40th anniversary in 1986 until the 60th in 2006 the Society has continued to meet. With the explosion of organised post-graduate education there has been ever more emphasis on social contact. The meetings are eclectic, ranging from Art, Literature, the History of aspects of Medicine through to Sport -Tony Spreadbury’s lecture about his life as a paramedic trained at Frenchay, and subsequent evolution to a International Rugby referee, being a wonderful case in point. The programmes for members and, later, guests to show the change in emphasis of the talks. After much doubt as to its role in the world of modern, budget driven medicine, it now seems that the building will have a medical role to play. Addendum. During 2007 it became clear that the Society was not attracting new members and was becoming unviable. A special EGM was convened in the summer where it was reluctantly decided to disband the Society. Compiled by James Briggs. President 1991-92. 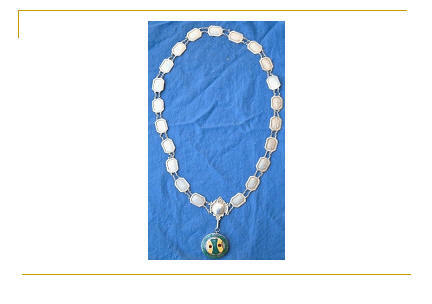 Presented to the Society 24th October 2006.